I searched like 5 hours for any way to redefine default action assigned to TAB key (to not switch between panels so to be able to use it for autocompletion). I looked over all mc.keymap config files, but it doesnt contain such setting. I checked man mc, internal mc help utility and this website wiki. No information at all. Is it possible at least? Also, similar qustions asked a couple of times in stackexchange/overflow and discussed a lot of times in different help forums, so many people stuck on that. This problem repels many new users out of using MC. I haven't tested the patch, but the code looks fine. If CK_ChangePanel returned MSG_NOT_HANDLED when there's only one panel shown (as in the case of the "Long file list" listing mode), then the TAB will be sent next the to command-line (see ​sequence diagram). This would let users use TAB to switch panels normally, but to auto-complete when only one panel is shown. The "ChangePanel" command introduced here is half of solving #3591. 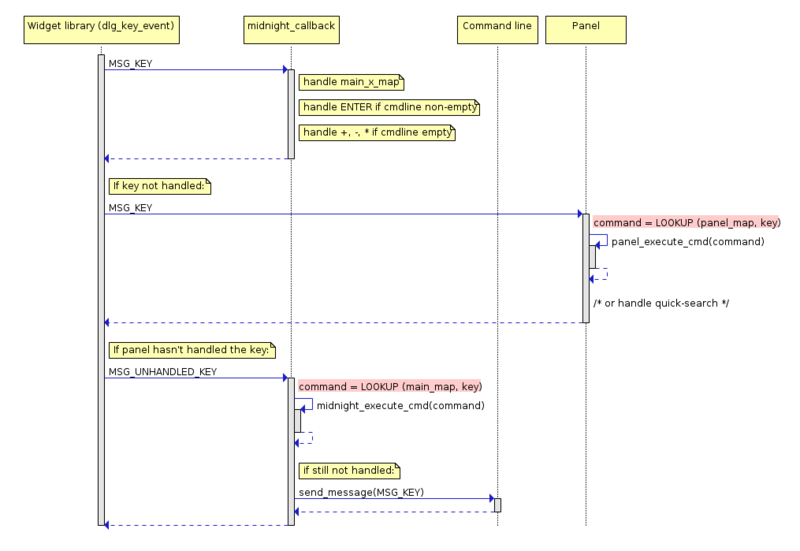 OT: @mooffie did you generate this nice diagram programmatically, or you drew it yourself manually? Just curious. It was generated programmatically. Here, where I introduced this diagram, I linked to its source script. Many years ago I used sequence diagrams to help me study some system. The tool I used for drawing was ​sdedit, which draws the diagram for you based on a textual description you give it. Unfortunately, its language is horrible for humans (IMHO), so I ended up writing a ​Ruby "DSL" that, given a less horrible syntax, produces input for sdedit. That's how I generated that diagram. I'd imagine that nowadays there exist nicer tools/languages for doing this. Yes, I tried in many ways (using mc.keymap in user's home dir and also global mc.keymap file in /etc/mc). My settings just ignored/overwritten. I like this idea as last resort case, I don't think this is the best idea because one key must do same action no matter how many pannels in screen, thats a good practice for any UI. Users will get used to press TAB for some action being in one panel view mode and will be confused trying to make same action in another view. The bad thing here is that you will be unable to switch if command line is not empty (like in case if you want to put to cmd string some file name from other panel). Generally, it should be possibly to redefine TAB for autocomplete action and TAB+something for panel switch. Alternatively it also will be useful to make some checkbox for inverting ESC-TAB (M-TAB) with TAB (so ESC-TAB will switch and TAB will autocomplete) - it is easy for configuration and hotkeys will act evenly in any cases. May be last solution is even better than making option for arbitrary redefinition, at least I use panel switching quite rarely and wont be annoyed to press two keys to switch (like now when I annoyed of having to press two key for autocompletion). Nice, thanks! I guess using apt-get for update wont get it because it is not released yet. What is a proper way to get this patch? Or better to wait until new version release? What is a proper way to get this patch? You can try a one of nightly builds. Or better to wait until new version release? The next release will be after a long time (several months). will autocomplete on the command line, but not on text fields in dialog windows (e.g. copy file, etc). Is it possible to have Complete = tab also for dialog windows? I tried putting it in the [dialog] section of my mc.keymap file but it doesn't work. Of course if this is implemented, we should also need to define another key to navigate through dialog fields (instead of tab). ... so I get tab completion on the command line, and old-style esc-tab completion on text dialog fields. File name completion via alt (or esc)-tab works fine for me in the copy/move dialog, in the "Save as" dialog in mcedit, etc. Is it possible to have Complete = tab also for dialog windows? Complete what? Each input line has its own specific stuff: file names, words, etc. For example, the file name completion for "Content" field of "Find file" dialog in pointless. Indeed, my message was about completion via tab (after setting Complete = tab), not via alt/esc-tab. Complete what? Each input line has its own specific stuff: file names, words, etc. Nothing new, I meant to have the same completions that are available now on each input line, only using tab instead of alt/esc-tab. Unfortunately, ​Tab and Shift-Tab keys are hardcoded to switch current widget in a dialog.